Hello zealmatblog fans we are here to present to you the blog of the year Joelwilliams Blog the Nigeria best entertainment blog of the year. This blog has been in existence since 2015 and the give the latest entertainment updates and easy and fast in navigation. 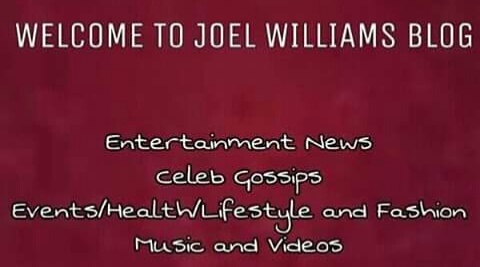 Joelwilliams Blog has a cool, simple looking design for her visitors and also with free and wide advert space for advertisements. This site is easy to access both on PC and Mobile which focus on a particular Niche (entertainment). It took me months to get that template done by just reading ur tutorials,sir u are the best,I am saying it againa and again,people are booking to advertise on my blog,3 young girls came to meet me,they want to model on my blog. That's my 7 point Agenda. Thats all,I was inspired when I was ten,and since then I have been trying and making effort to accomplish my goals it was of recent my elder bro start putting fire in my buttocks to sign up for Adsense and start earning,that i cant be serving people my stories for free,thats why I asked for Adsense yesterday. . .
Am on my own,but I think my financial source is the little savings from the money people dash me,my transport fare going and coming back from school,i dont even eat in school,lol! My older bro is helping out a little,and my mom,although she thinks online business is Illegal but i have made a promise to change her point of view about online business,the good aspect of it though. Finally, as ever, I would ask you to help us by telling us about the things that we can improve upon. We cannot tackle every issue as quickly or as well as either you or I would like, but we will make every effort to follow through. Thank you. Thanks alot,wooooooooooooooooooow!!!!!!! oh my God!!! oh my God!!! Interesting!!! I repeat again. Interesting!!! Mr. Joel, first and foremost, accept my congratulations. I pray you fulfill your 7 point Agenda. In Jesus name! Your blog is okay, but the Ads, chai!! Many die. And yeah, stop starving yourself in school and eat FOOD! Lol. Stay healthy stay wise!